Dance Road Company, presented the 2009 Selma Jeanne Cohen Lecture in International Dance Scholarship on Saturday, Oct. 31, at the Madison Hotel in Washington, D.C. Dr. Gray is adjunct professor in the Department of Theatre and Dance at George Washington University. 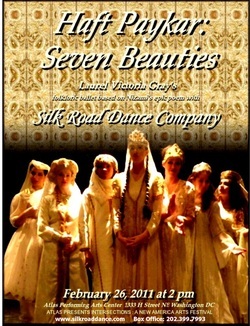 performance by members of the Silk Road Dance Company of traditional Uzbek dances from the company’s Legacy Repertoire. Ms. Gray first visited Uzbekistan in 1973 and, in 1981, joined the Seattle-Tashkent Sister City Committee. She participated in the official 1984 delegation of Seattle residents to Uzbekistan and founded the Uzbek Dance and Culture Society that same year. Gray also co-founded of an annual dance camp that hosts dance instructors from Uzbekistan. In 2007, she was awarded an honorary doctorate by the Uzbek Ministry of Culture at a ceremony held at Tashkent's Institute of Art in recognition of her work in promoting and preserving traditional Uzbek culture and dance. She has produced performances at the Kennedy Center for Performing Arts and the Embassy of Uzbekistan in Washington, D.C. She received the Kennedy Center’s Local Dance Commissioning Project Award for her production of “Egypta: Myth, Magic, and Mystery” in 2003. “I hope that my study of women's dance of Silk Road regions has helped to cultivate better understanding of, and respect for, traditional cultures of the East,” Gray said. Central Asia,” said Ms. Gray. serenity, fairness and devotion to God. Since Bahram Gur is destined to become Ruler of the World, he must learn these lessons in order to govern wisely. His spiritual journey is a reminder that only through self-knowledge and self-mastery can humans find perfection.